Rabbit plasma is a lyophilisate, vacuum-dried from frozen preparation of a pink-creamy colour, obtained from blood of healthy rabbits, free from infectious and contagious diseases, remaining under constant medical supervision. The preparation, once appropriately prepared (reconstituted) corresponds to 2 ml of fresh rabbit plasma. 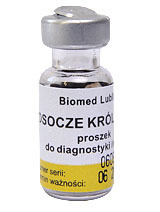 Used in staphylococcus diagnostics in tube and glass tests.